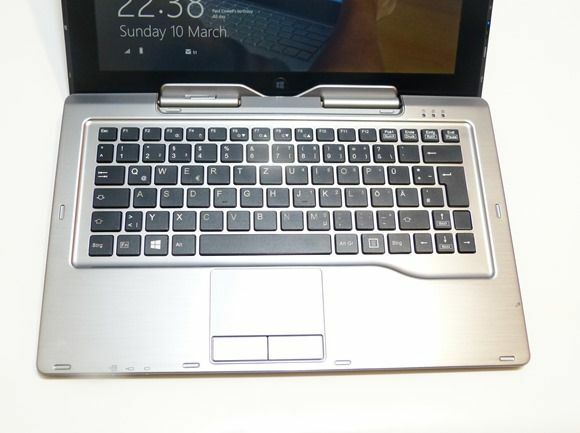 The Fujitsu Stylistic Q702 isn’t an Ultrabook but at 1.6KG (including dock) and built around ‘ultra’ components including the Ultrabook-level Core i5 CPU, a fast SSD, dual-layer touchscreen and including VPro, fingerprint reader and a double-battery system, it exceeds the capabilities of many Ultrabooks. Only the thickness of the Q702 prevents it from being an Ultrabook but for the weight, you won’t find any Ultrabooks that have the battery life that the Q702 does. Fujitsu Stylistic Q702 Review model full specifications. Touch Technology: 10-point Multi-touch. NTrig digitizer with pen included. 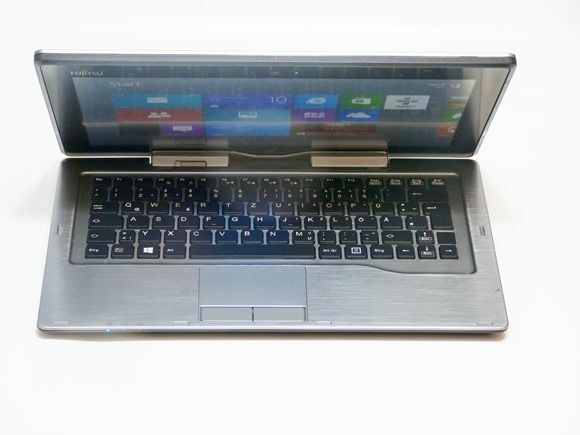 Unbranded single-touch touchpad with separate mouse buttons. Battery capacity: 34 Wh in tablet section. 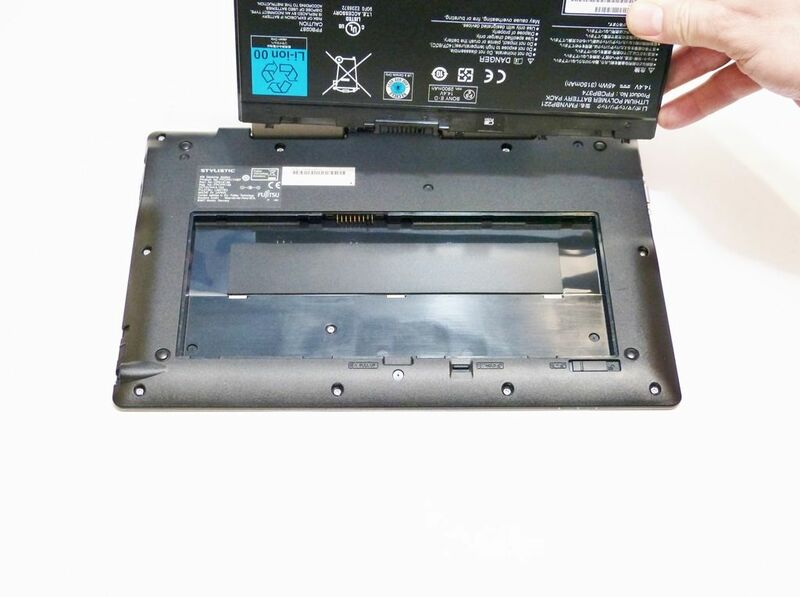 45Wh removable in keyboard section. Ambient light sensor. Rotation sensor. 5MP rear cam. 1.3MP front cam. Stereo speakers. Array mic. The Fujitsu Stylistic Q702 isn’t the most attractive of packages. 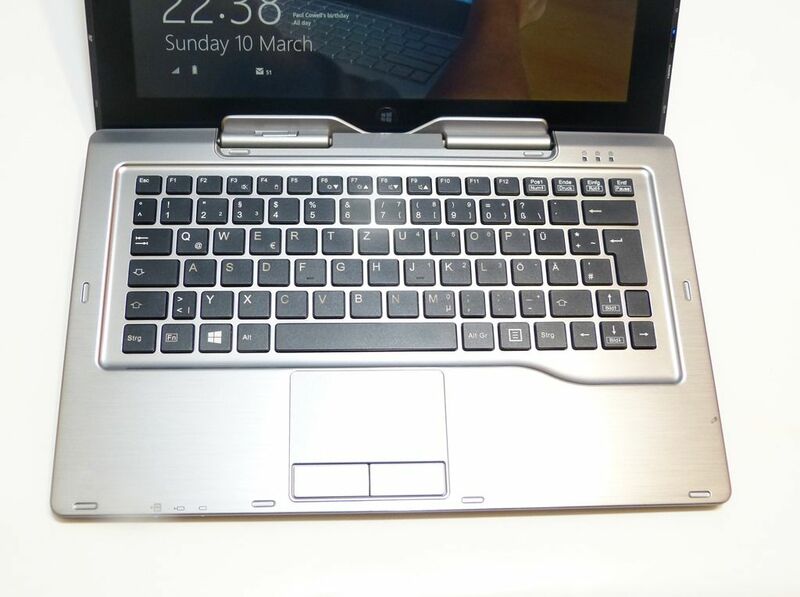 It’s relatively thick and chunky, has a keyboard that looks like it came from a 10” netbook from 2 years ago. It sports a big silver VGA port on one side that looks like it was retrofitted. 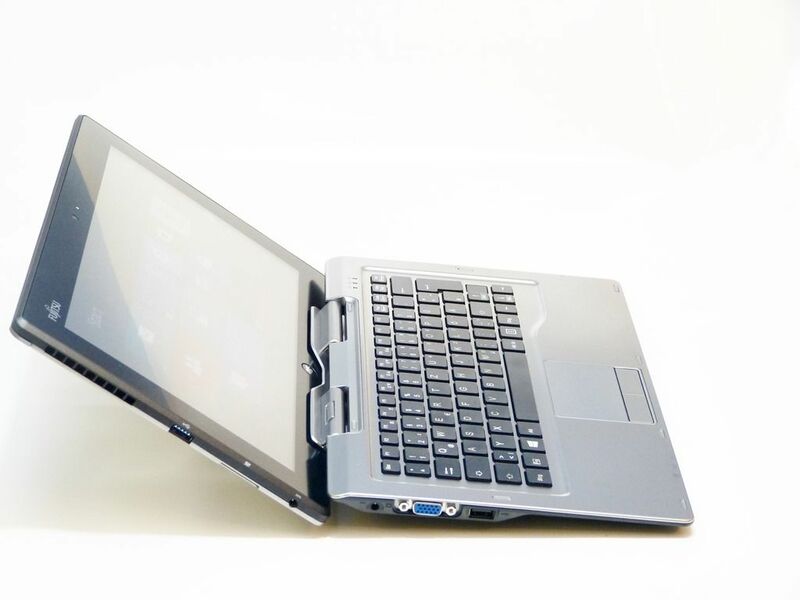 1.6KG for an 11.6” laptop isn’t exactly light either – the Acer S7 comes in at 1KG for example. 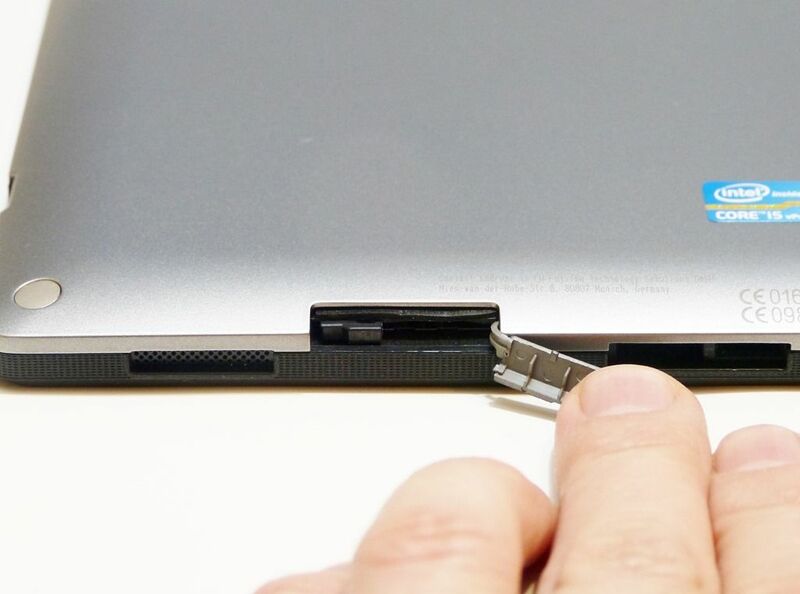 The trackpad looks small and on first boot the screen appears a little weak and washed out. It sounds terrible doesn’t it but remember, we’re not dealing with a fashion victim here. Book, cover, we’ll say no more about the aesthetics. While the port selection is good there are a few things to note. Firstly there’s no Displayport output. Secondly, the VGA port is on the dock but the HDMI port is on the tablet. You’ll need to take the dock with you if you need the VGA port. 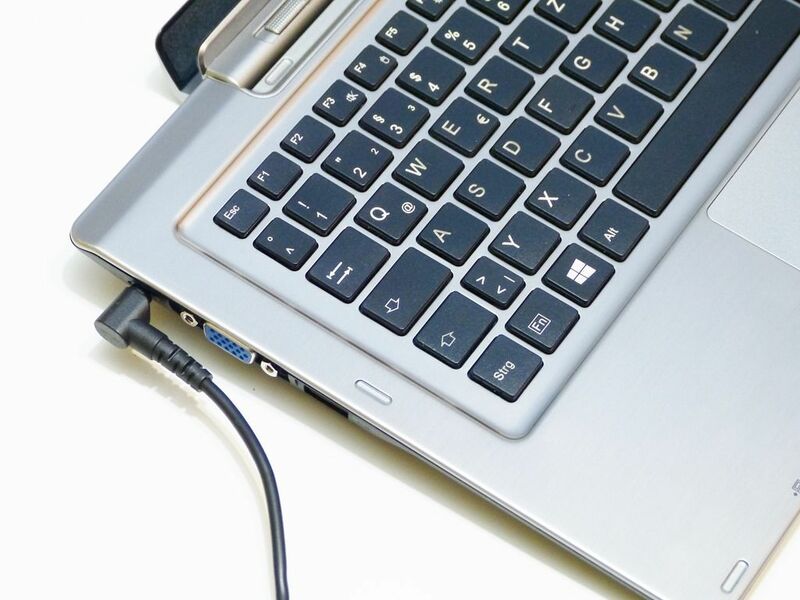 There’s only one USB3.0 port and we couldn’t detect any sleep-and-charge which can be extremely useful for those overnight hotel-room charging sessions. The SIM card slot is hidden behind the hinge when docked. We mentioned above that the trackpad looks small, the keyboard looks similarly small and the screen appears a little washed. Let’s start with the screen. This is a 1366×768 wide viewing angle panel with 10-finger capacitive touch and an NTrig digitizer layer. It includes a slightly matt finish. It also includes an ambient light controlled backlight which you can’t override. It works but there are occasional moments when it would be nice to have full control, especially for presenting using the tablet. The backlight tends towards energy efficiency and in addition with the matt finish, tends to take the punchiness away. The digitizer works will but despite trying to force ourselves to use it for daily operations it felt awkward. 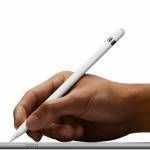 It’s there for those that need it for graphics, annotations, handwriting recognition and editing but it’s not really useful for tech journalist types like us. Over time, we’re sure we’d find uses for it with annotating. Kids would probably enjoy it too but remember that it’s an expensive tablet! The touchscreen on our review sample had a major problem. We’re not sure if it’s related to heat but towards the end of our second week of use the touchscreen occasionally registered touch on the top-right of the screen without us touching it. It caused applications to lose focus. It was serious enough that we looked for a way to disable the touchscreen and eventually had to stop using the Q702. We lost work, we ended up editing something we didn’t want to, we failed to get touch responses some of the time. When you’re under pressure to get an article finished it is as annoying as a jumpy mousepad. This is clearly a fault with our review sample and we’ve already spoken to Fujitsu about it. We’ll update with info here when we get a response. If you buy the Q702, keep a check on this issue and contact Fujitsu or your reseller if you experience it. As for the mousepad, we initially thought we had a problem there but it’s obviously the touchscreen causing the jumpy-pointer issue. However, the mousepad is a simple single-touch unit and should be better. The mouse buttons are solid and reliable but come-on Fujitsu, there’s no place for single-touch touchpads on anything but the cheapest of laptops. Moving on to the keyboard we can see why it doesn’t extend to the width of the base-unit. 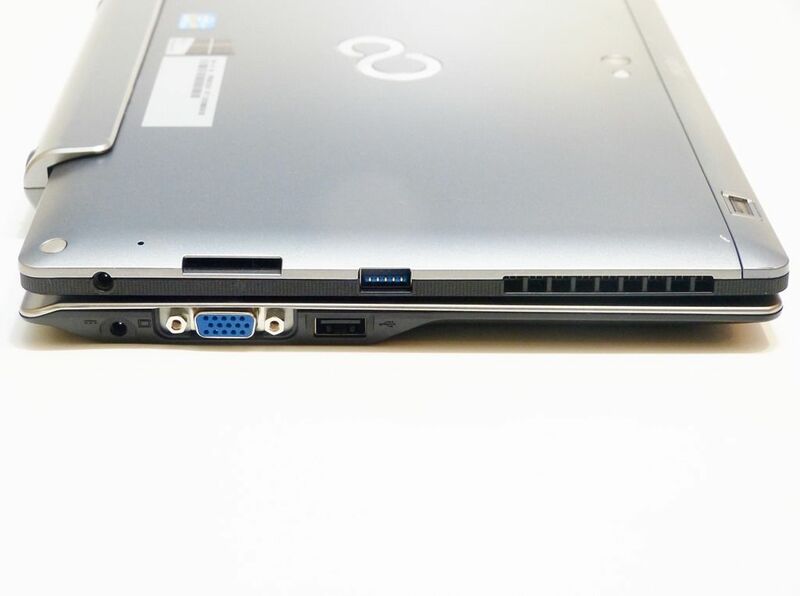 Those ports take a lot of room. Fortunately the keyboard is very accurate and reliable and once we got used to it we had no problems at all. Two things you must be aware of though. 1) There’s no backlight. 2) After just two weeks of typing the cream coloured keycap lettering faded due to dirt and we can’t clean it back to original easily. This could be an issue over time unless the user can find a way to clean the caps without damaging the lettering paint. 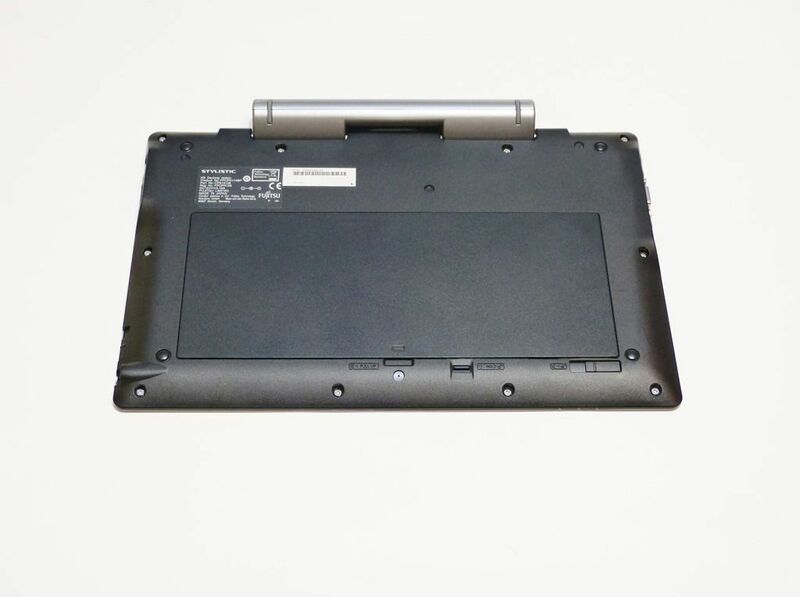 The key feature of the Fujitsu Q702 design is the separable screen and keyboard unit. Known as a hybrid design, it allows the user to use the device in more than the usual desktop or lap scenario. 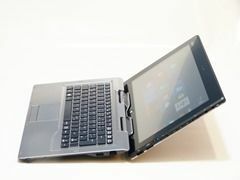 Unlike the Intel Atom Clovertrail-based hybrids which lean towards being a tablet first and laptop second, this Intel Core-based hybrid is primarily a laptop first and that’s to do with the performance, the weight and the battery life of the tablet. Compared to even Atom-based tablets of a few years ago it’s not that heavy but it’s still outside the comfort zone for long-term casual usage. With a battery capacity of 34Wh within the tablet it won’t last for much longer than 4hrs too so keeping it docked and charged is important. An interesting design issue is that the digitizer pen ‘garage’ is in the base unit making it possible that you don’t have it with you when you use the tablet. The docking system is a simple affair but do be aware that this could be a weak-point over a longer period of time. Constant docking and undocking, especially if done without care, could result in worn connections and even after two weeks we have seen a couple of situations where the screen went blank on us. Also note that this isn’t a simple USB-based extender as it includes a VGA port and battery. The price of the dock reflects that. The additional battery is worth more than you think. Not only does it push the total battery capacity for the unit to a class-leading 80Wh, it’s removable too. Not only that but because you can remove the tablet from the dock, you get hot-swap capability. One spare battery brings you to 125Wh and 12-15 hours of productivity which is truly an all-day, worry-free capability in well under 2KG. Note that the battery weighs about the same as the power supply so if you leave that at home, you’re still under 2KG in weight. 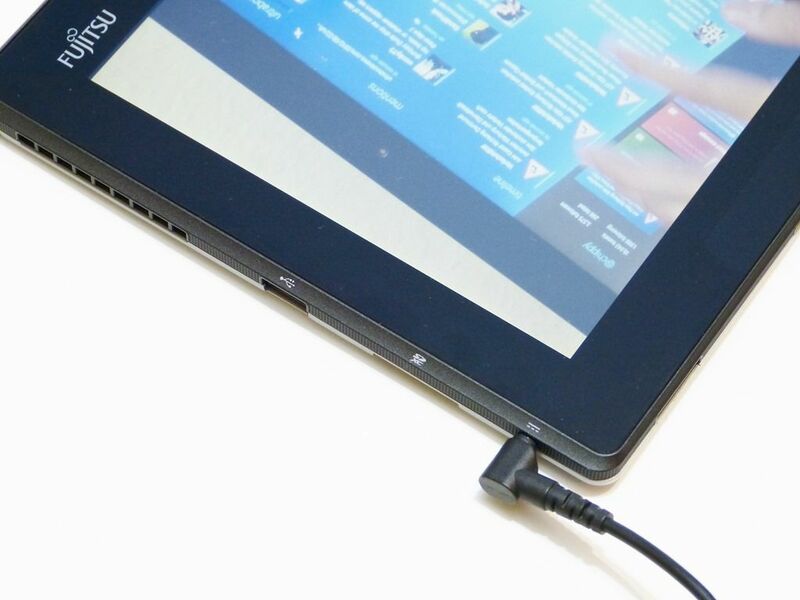 It’s this battery life flexibility that is the highlight feature of the Fujitsu Q702. More on the battery life later. 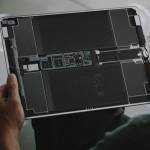 Stuffing a Core CPU into a thin tablet is not the easiest of electronic engineering tasks. The Ultrabook-style platform used in the Fujitsu Q702 has the potential to burn 30W or more and that creates heat that is difficult to dissipate in such a tight space. The Fujitsu Q702 appears to have addressed this issue in a surprising way – downclocking below the nominal 1.8Ghz frequency. It’s an issue we can understand but one that we don’t think customers will be too happy to find out about after they’ve purchased the product that resellers are billing as a powerful Core-based solution. We’ve got a query out to Fujitsu on the subject right now but aren’t expecting to see any fixes simply because of the thermal limits in play here. Overheating would be a more serious issue than downclocking. Here’s what we’ve seen. In general the Turbo boost feature works and for short periods of work we’ve seen the CPU boost up to 2.6Ghz. During extended periods of high CPU load, however, the clock drops quickly to the point where you’ve got a PC that’s about half as powerful as you were expecting. You can try and use ‘high performance’ mode and lock the CPU to 1.8Ghz but it doesn’t work. Our video rendering tests saw the CPU drop to under 1.0Ghz which is a serious hit when you’re waiting for a 5 minute YouTube video render. Fujitsu have built in their own power saving technology too which seems to override the standard Windows power profiles. Perhaps the new cTDP-down power-saving features are being used? Whatever the cause, it should be more clearly stated in specifications and descriptions. The impact on performance scores can be seen below. 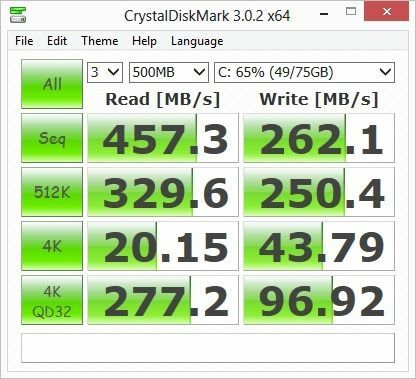 While the SSD is extremely fast, the CPU-bound tests show poor results. The advantage…longer battery life, cooler temperatures and quieter fan. And note this, there’s no advantage in docking the unit and powering the tablet or dock is simply going to result in more heat and lower CPU performance. The speakers are clear (but nothing special and could be a bit louder) and there’s a separate mic and headphone/analogue output jack. HDMI (including digital audio of course) is built into the tablet frame. While there’s no WiDi software installed, the hardware seems to be in place to support it. CD-quality audio can be sent wirelessly to a WiDi receiver using this method. Overall there’s a good selection audio possibilities, including support for USB mics – something you won’t find on Android or Apple tablets. WiFi and 3G modules are high quality and are paired with well-tuned antennae to make one of the most receptive radio setups we’ve used. We did experience a regular drop-out on one 5Ghz network at a tradeshow but apart from that it’s been exceptional and a real aid to productivity in difficult shared-hotspot environments. 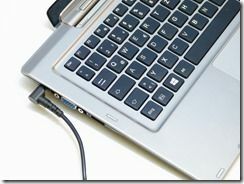 The Fujitsu Q702 offers VGA, HDMI and WiDi video outputs but there’s no DisplayPort. The HD 4000 internal GPU is enough for most office-based and web-based tasks and includes video encoding and decoding acceleration too. Given the throttling issue mentioned above we don’t recommend the Q702 for PC gaming. See the 3DMark scores below. All performance test done under ‘balanced’ battery power mode and Fujitsu ‘high performance’ CPU mode unless stated. SB= Sandy Bridge 2nd generation Intel Core CPU with HD 3000 graphics. 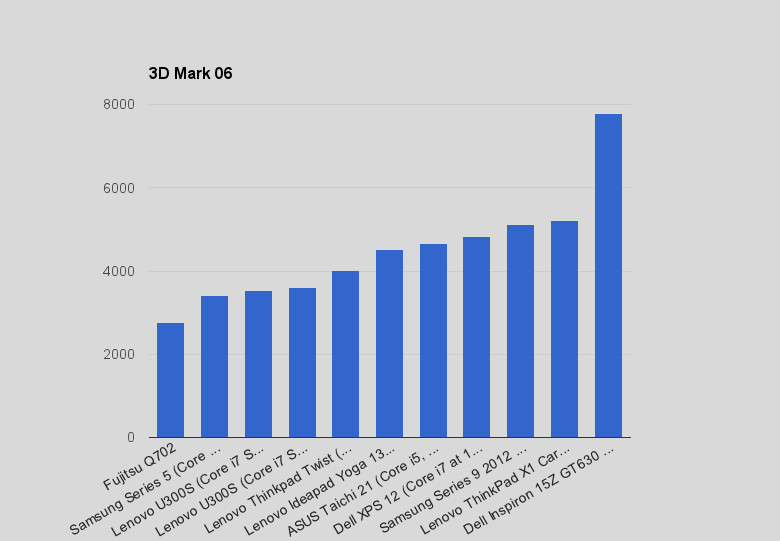 The 3DMark06 score is the worst score in recent testing history on Ultrabooknews and a reflection of the throttling that takes place under load. 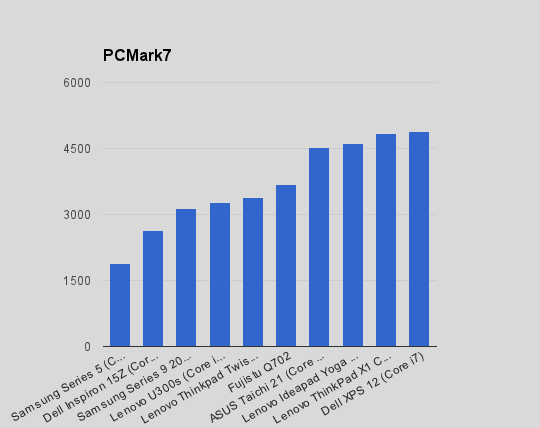 The PCMark7 score indicates good all-round office-like performance although a large percentage of the result is due to the very fast SSD. With one of the biggest total battery capacities you can get in a device weighing 1.6KG, you’d expect the Q702 to do well. It does! It’s a true all-day device for most people and in the two-week test over MWC and CeBIT events we got confident about leaving the charger in the hotel room. The Fujitsu Q702 has been tuned for battery life and that has a positive effect on noise and heat which weren’t an issue at all during the test period. In a quiet office the fan can be heard but it’s a bearable hum. During charging and heavy operations some heat is generated towards the output fans on the left of the device. With over 110 processes running after boot the Fujitsu Q702 has a lot of action going on in the background. Most of this is attributable to Fujitsu software applications and, on this model, the security features. 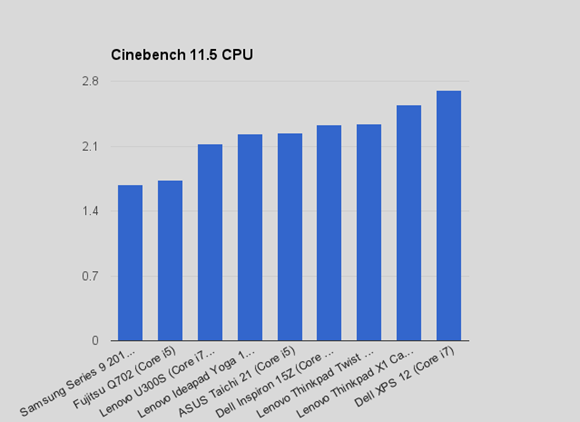 A clean version of the Q702 without VPro might deliver a faster, cooler performance and longer battery life so if you don’t need VPro, consider a Core i3 build of the Q702. Clearly this is a B2B product and retail channels may not carry all build variations. No updates from the built-in driver updater during the two weeks. Jumpy touchscreen with random input. Suspected pinched screen fault as mentioned above. 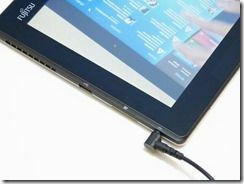 Tablet screen occasionally blanks when docking or undocking. Occasional WiFi drop-out on 5Ghz band in one particular hotspot scenario. Note that Core i3 versions do not support VPro and may not have Centrino WiFi. SSD sizes can be as low as 64GB. An additional battery is $140 in the USA which we find excessive for a 45Whr part. Look for offers! The dock costs $389 from Fujitsu in the USA. The Fujitsu Stylistic Q702 under test is a do-everything hybrid with adequate performance, a full suite of high-end security features, well tuned WiFi, fast SSD, a rich set of ports and quality components all-round. The price reflects the capability here and for anyone requiring total flexibility from a dockable tablet this has to be one of the best options out there. CPU and GPU performance isn’t up there with the best so for those of you doing large analytical operations, rendering or large amounts of photo work, that might be noticeable but in general, mainly due to the fast SSD, the feel of the device is nothing less than fast. 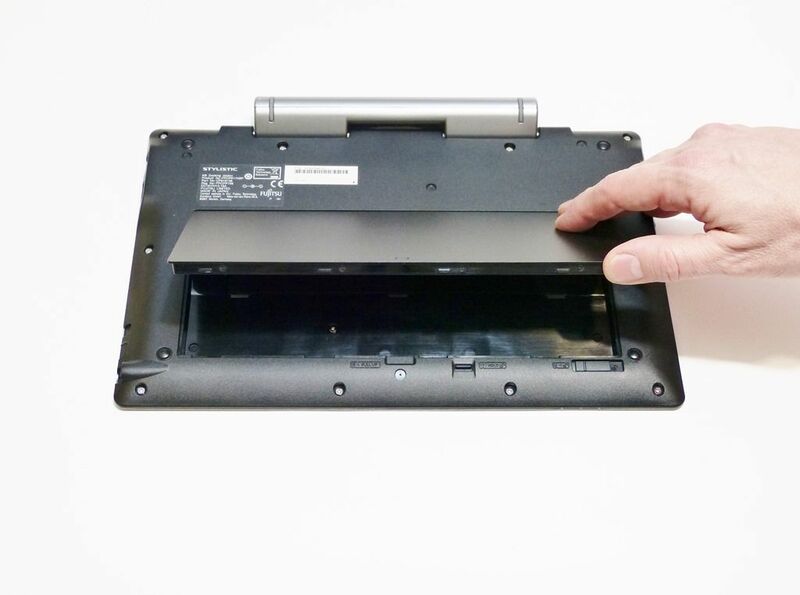 Due to the docking connector we wouldn’t recommend the Q702 for people in areas where a rugged tablet dock is required – we just don’t feel confident that it will last if daily use includes docking and undocking many times. For customers wanting real all-day battery life, this hybrid setup has to be the best out there for the weight. If you don’t need VPro, look for a Core i3 1.8Ghz without VPro and fingerprint reader and you could get a reasonable price. 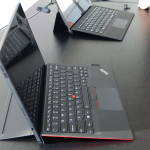 Hybrids are expensive and if you’re looking for the top security features and a digitizer you’ll pay a lot more than the average Ultrabook based on the same processing platform but at 1700 Euro, the Q702 did feel it would be worth it for those needing the features. 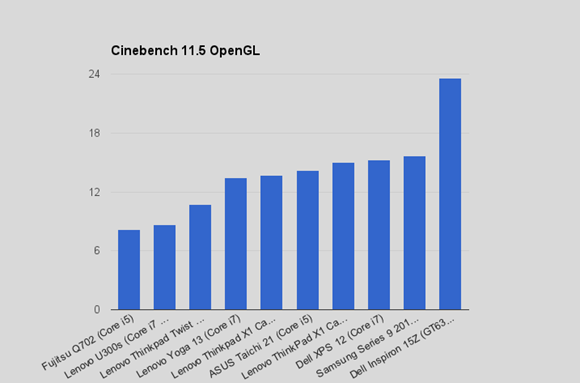 In the USA, Core i3 versions without VPro are a reasonable $1370 and given the clock throttling, the Core i3 could be the one to go for if you don’t need VPro. Personally we’d drop the hybrid part but keep the battery capacity, if it was possible, but it’s the hybrid design that brings that hot-swap and dual-battery capability so If you need that battery life, take the hybrid route even if you don’t think you’ll use the tablet. The Fujitsu Q702 is a fine, professionally-targeted example. Full Fujitsu Q702 gallery here. 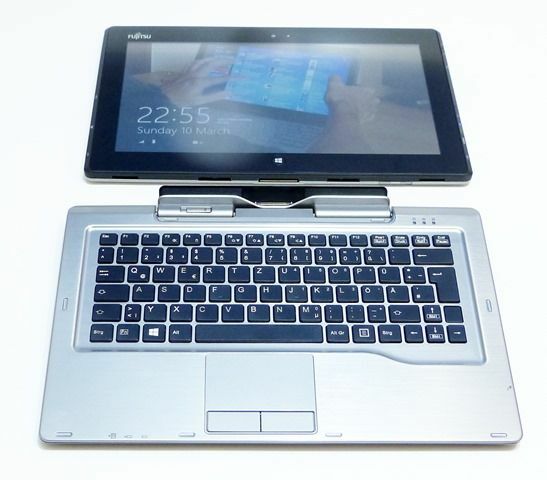 Our Fujitsu Q702 information page here with links to more news items, specifications and videos. Also have the jumpy pointer issue sometimes… very annoying. But never when the slate is undocked. I wonder if it’s not due to a hypersensitive dock/touchpad. It is a very good unit overall. But I would want some clarifications about this pointer issue before to recommend it. Thanks grimy55. I’m waiting for Fujitsu feedback on this issue. Interesting you don’t get the problem when undocked. Same issue here, it makes the Tablet useless unless connected to an external monitor. Fujitsu is looking at this. If they get back to you before they get back to me, please drop me a line. I will post here their answer. Thx for the review, Steve. It is true that Q702 is a nice product. 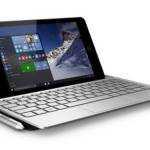 If we compare it to Sony Vaio Duo, which one is better? 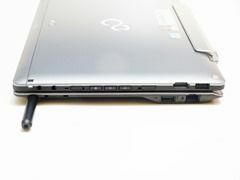 Seems that Sony Vaio Duo has a number of similar features including variety of ports, Ntrig-pens, and also long battery life (with additional battery dock). I can’t believe after all these years Ntrig hasn’t sorted their issues with their screens. The “ghost touch” issue is well documented – including by me! It’s unacceptable for a dual touch screen to be like this especially when the Wacom screens do not have this issue. I loved the Dell XT as a tablet but the screen issue caused me to get rid of it (and the XT 2 as I was silly enough to go back for a second try). 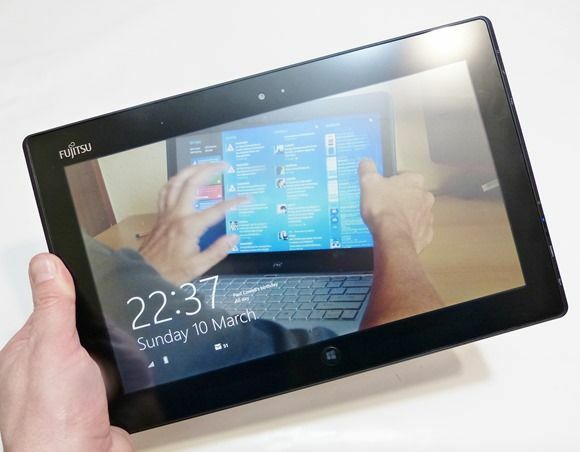 This almost looks better than the Surface Pro 2! It appears to have a better trackpad, superior connectivity, a bigger screen, greater screen angle flexibility, and more battery packs. The only notable shortcoming that I can see here is the narrow keyboard.